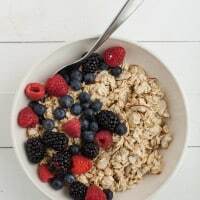 Mixed Berry Overnight Oats | Naturally.Mixed Berry Overnight Oats | Naturally. The night before, combine all the ingredients in a bowl. Cover and refrigerate overnight. Serve cold the next morning. If desired, place oats in a skillet with a bit of melted butter over medium-low heat to toast for 3 to 4 minutes. Remove from heat and let cool before continue to assemble.